An Electric Mobility Canada’s article can be read in the Toronto Star this morning. The article titled “Convergence And Collaboration For The Benefit Of All Canadians” is part of a special section dedicated to EVs and also features EMC members FleetCarma, Power Workers’ Union and Plug N’ Drive. Read this special section on electric vehicles. Five years after electric vehicles (EVs) have hit the roads, there are more than 20,000 EVs in Canada. They are mainly concentrated in Quebec, B.C., and Ontario, where successful conditions are offered by provincial governments, and many other active stakeholders. Quebec continues to be the national leader with nearly 50 percent of all Canadian sales. In 2016, Quebec and Ontario showed accelerated sales, while B.C. had the most notable jump, likely due to the reintroduction of their $5,000 provincial rebate for electric car buyers, and a confirmed leader on a per-capita basis. Today, EVs can address the needs of most of the potential buyers, which is shown by the growth in diversity of the plug-ins sold. In the next two to three years, the arrival of affordable EVs with more than 300 km range will play a significant role in the adoption of EVs to move forward from an early adopters market to a mass market. A strong national policy on transportation electrification is required now in Canada. EVs, a proven technology, produce low emissions and are an important opportunity for the reduction of greenhouse gas (GHG) in transportation. They are particularly appropriate for Canada because most of our electricity is generated from non-fossil fuel sources and the price of electricity is fixed in Canada, not by the global oil markets. Canada has leading companies in EVs and charging technologies, and those businesses will prosper with the growth of EVs. EVs are fun to drive, are four to six times cheaper to operate, when comparing fuel costs, maintenance costs, and even insurance costs. They are an available solution to Canada’s emerging energy and environmental issues. EVs are truly good for Canada. It is important to work on all modes of transportation, for individuals, car sharing, and to increase the share of electrification in public transit. 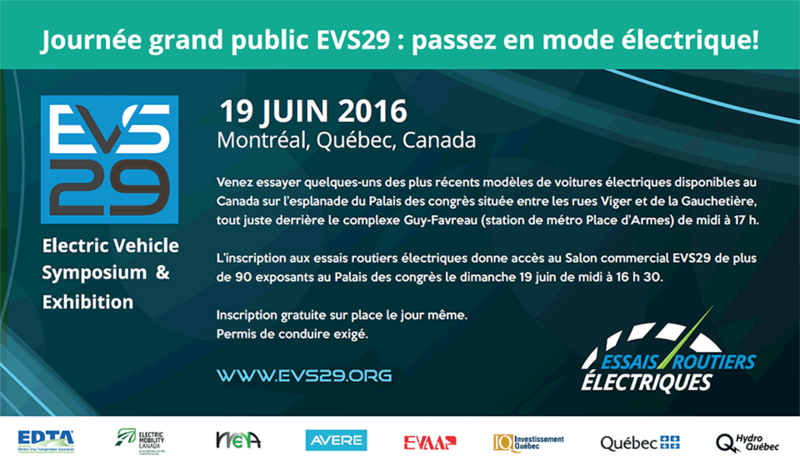 Electric Mobility Canada’s recent EV Roadmap recommendations address these priorities. It is proven that the combination of education (to build awareness and provide correct and complete information), promotion, incentives, infrastructure, and availability (of different models, class types, and of inventory) is the best method to increase EV sales. All relevant governments and stakeholders need to work collaboratively and intensify discussions to bring pragmatic solutions forward, ensuring a clean growing economy is associated with transportation electrification, and the objectives of the Low Carbon Fund and its investments. EMC represents the complete value chain of transportation electrification, and wishes to be part of the discussions. All Canadians have a key role to play in this objective. The World Electric Vehicle Symposium has been gathering global leaders from industry, government, and academia to address technical, policy, and market topics in the electrification of vehicle fleets, since 1969.